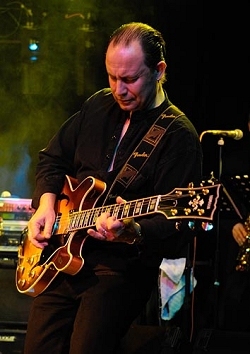 My cousin David Western who was a brilliant guitarist and a big influence on my playing, others include Larry Carlton, Steve Lukather and Robben Ford. It started with small pub bands in my late teens, I then joined a band call Headline with Jim & Bev Maryan playing clubs up and down the country for a few years, then came back and started a band called Cry Freedom in conjunction with another band Tuxedo Junction. Once they had run their course I teamed up with Lee Jacobs and Gary Woods putting together Whippet a rocky blues power trio. As well as the regular gigs Whippet supported and toured with the likes of Doctor Feelgood, 9 Below Zero, and the Mighty 45’s. I now play in band called The Gophers with Tim Marriott & Kev West.